Nick Desrocher (#2) hit a 3-run homer over the centerfield fence. (Byfield) Plenty of excitement in this one. Newburyport ended a three-game losing streak defeating Triton, 8-7, at windier-than-usual Triton on Thursday afternoon. The game had runs, hits, errors, clutch relief pitching, and controversy. The Clippers (8-7) had a nice 6-1 lead going into the bottom of the third inning. 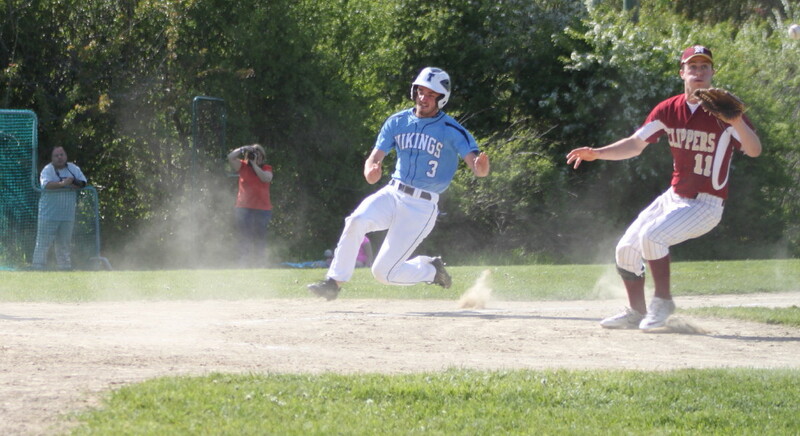 However, a 2-out error by shortstop Colby Morris enabled the Vikings to add four runs to the two they already had scored in the inning. After three innings, the home team had a 7-6 lead. Newburyport would regain the lead in the fifth inning with two runs. One scorer (Mike Sweeney) reached on an error (Jon Seward) and another (James Nutter) was hit by a pitch. Those two Clippers runs provided the one-run margin that held up for the winners. The hero for Newburyport was reliever Scott Webster. The freshman righty came on with the bases loaded in the fifth and two outs. He fell behind 3-1 to leadoff batter Dmitri Hunt before getting him to ground out. Triton came very close to tying the game in the sixth. A two-out walk to Nick Cornoni was followed by a double over rightfielder Ryan Short’s head. The Clippers were fortunate that the double bounced over the fence because with two outs Nick probably would have tied the game if the ball had stayed in play. But it didn’t and Scott fanned pinch hitter Matt Souliotis to escape with Newburyport’s one-run lead (8-7) still in place. 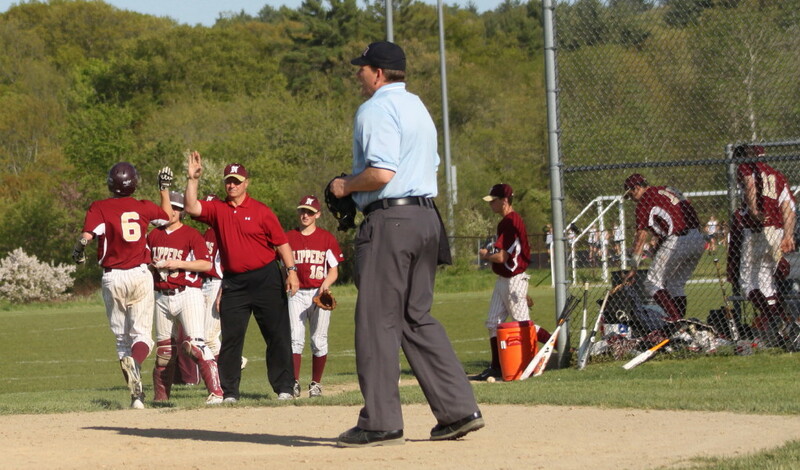 Controversy was a big part of the Newburyport half of the seventh inning. One sure way to create “excitement” if you’re umpiring is to make one call and then change it in a one-run game. But that’s what happened. Blame Brian Fiascone. Thinking there were three outs (there was only two) after grounding into a force play, Brian left the field and headed for the Clippers bench. 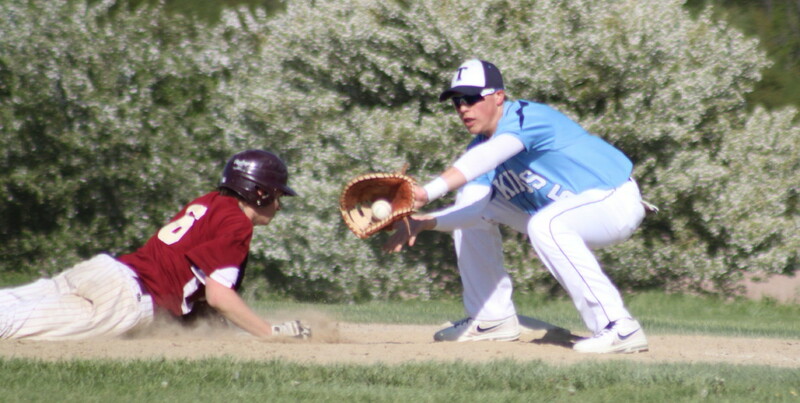 Both coaching staffs realized what had happened and Brian scampered back to first……..barely and was called “safe.” The Triton coaching staff had a bad reaction to the call and got the two umpires to discuss it. Next thing we knew Brian was “out.” Now it was Newburyport’s turn to get a bad reaction. A protest was going to be filed by NHS coach Steve Malenfant and in addition Connor Wile and Andrew Fiascone were kicked out of the game for their comments. But the “out” call stood and the inning was over. The bottom of the seventh was all Scott Webster. He K’d the side getting Nick Desrocher (who had hit a 3-run homer in the third) as the final out to earn the save. Justin Cashman surrendered ten hits and took the loss for the Vikings but five of the eight runs against him were unearned by my figuring. 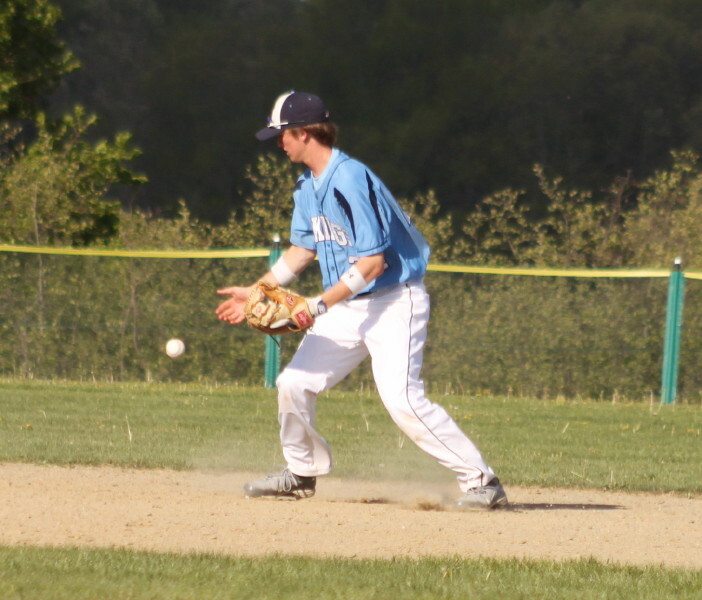 Second baseman Jon Seward had a rough day in the field with three errors. Conditions were tough in the field. The combination of bright sun, gale-force winds, and swirling dust gave both teams trouble. Two errors in the first inning (Jon Seward and Brad Whitman) allowed the Clippers to get off to a 3-zip lead. Triton got one back in the bottom of the first. A two-base throwing error by third baseman Colton Fontaine, a fielder’s choice, and a wild pitch (Evan Habib) enabled Dmitri Hunt to score. 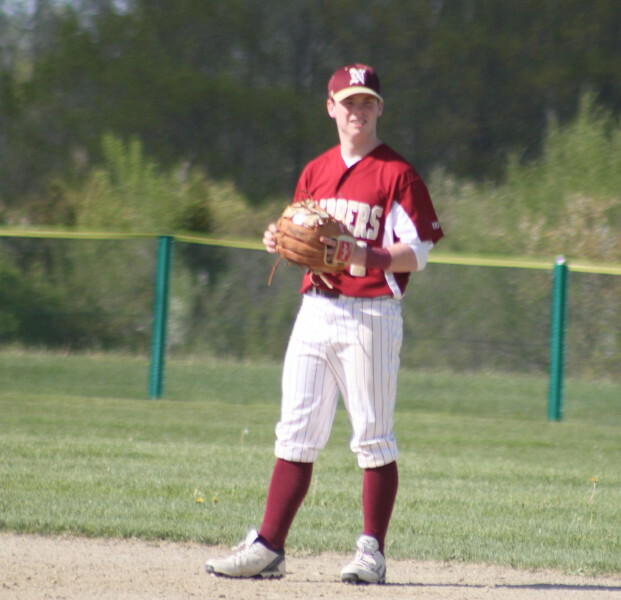 In the second inning, Newburyport added a pair of runs. Smart base-running was the key. James Nutter walked, stole second and came home on Colton Fontaine’s single. Colton took second on the throw in and scored from there on Colby Morris’ single to left. The Clippers ran into an out in the third but came away with their sixth run. Chance Carpenter went from first to third on a wild pitch. However, his attempt to get home on, what looked to be, a suicide squeeze failed because he left early and was tagged out easily. But with two outs Ryan Short walked, took second on a passed ball, and rode home on James Nutter’s single to center. 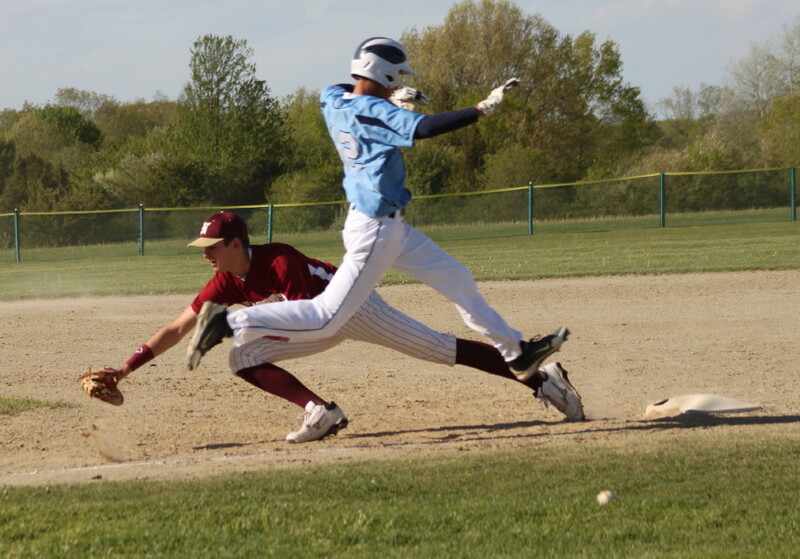 Triton started the third with a walk (Cote Wolcik) and three straight singles (Justin Cashman, Nick Cornoni, and Adam Chatterton) and had two runs in with two outs. 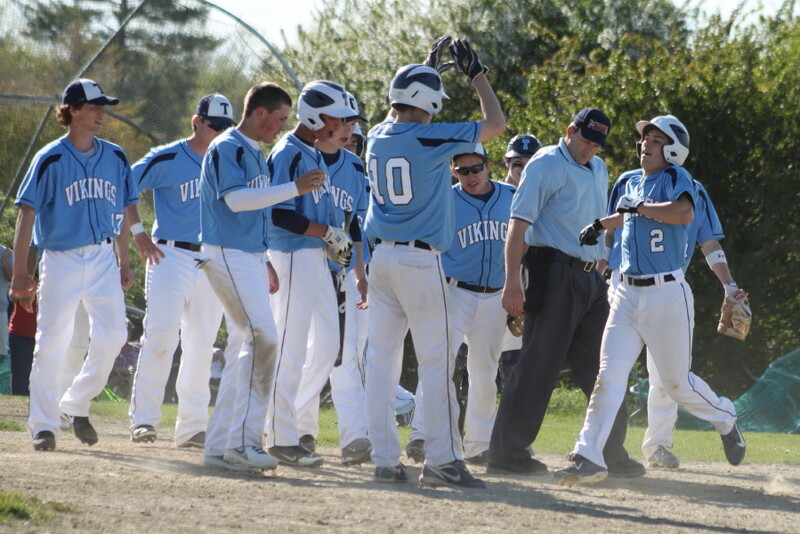 Colby Morris’ error led to the third Vikings run and then Nick Desrocher delighted the sizable Triton crowd with a 3-run blast to straightaway center. No question the wind helped. It was Nick’s first home run. The Clippers capitalized on an error and a hit bats man in the decisive fifth inning to set the stage for an RBI double (Colton Fontaine) and an RBI sacrifice fly by Brian Fiascone. Colton Fontaine scored a run, had three hits, and drove in two runs. Colby Morris had two hits while James Nutter scored two runs. 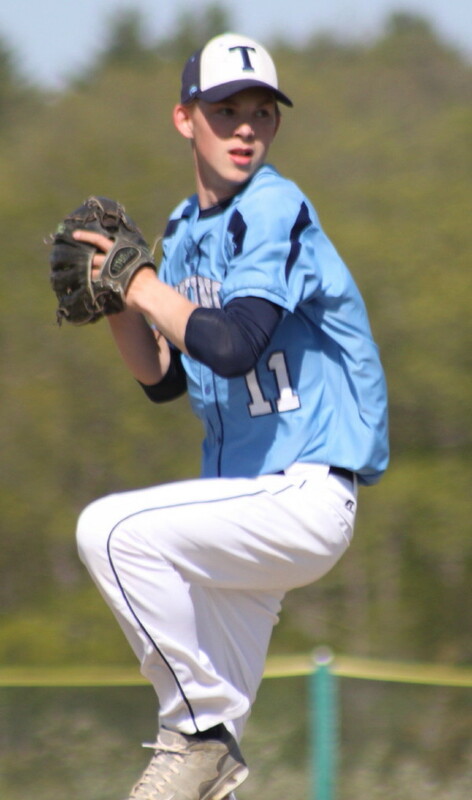 Adam Chatterton had two of Triton’s five hits and an RBI. Nick Desrocher walked twice and had the 3-run long one. Jake Barlow filled in for Connor Wile behind the plate in the seventh inning. 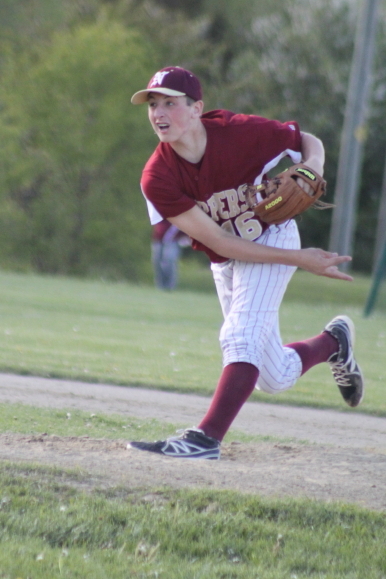 The Clippers defeated Triton, 4-3, at Newburyport on April 19th. Both teams return to action on Saturday (10AM). Triton hosts Pentucket while Newburyport hosts Hamilton-Wenham.